-Chris gives a (brand-spanking-new) seminar entitled "Can organisms adapt to environmental change? Insight from studies of natural selection" to the EEB Department at the University of Minnesota. See the announcement here. -Chris, along with colleagues Chase Mason and Juliana Medeiros, is organizing a Botany 2019 Colloquium on "The Evolution of Functional Traits in Plants: Is the Giant Still Sleeping?". See the description here. -Chris' meta-analysis of the agents of selection on floral traits is accepted for publication in Evolution. This paper is a collaboration with Ryan Martin, Nina Sletvold, and former lab technician Kate Eisen. Thanks to NESCent for supporting this project with a short-term visitor fellowship. -Chris, along with colleagues Chase Mason and Juliana Medeiros, is editing a special issue of the International Journal of Plant Sciences on the Evolution of Functional Traits in Plants. See the call for papers here. -MSc student Hazel Panique successfully defends her thesis. -Chris arrives at the University of Minnesota, where she will be spending 12 months as a sabbatical visitor. ​-Chris travels to Montpellier to present at the Evolution meetings. -Senior thesis student Sarah McDonald and MSc student Hazel Panique present their research at the Annual Meeting of the Canadian Society for Ecology and Evolution (CSEE). -Chris is a panelist in the lunchtime discussion on "Navigating the journal review process" at the the Annual Meeting of the Canadian Society for Ecology and Evolution (CSEE). -Senior thesis student Sarah McDonald and MSc student Ariana Longley present their research at the Ontario Ecology, Ethology, and Evolution Colloquium (OE3C). -Senior thesis student Sarah McDonald receives a Young Botanist Award from the Botanical Society of America. -MSc student Ariana Longley is awarded an Ontario Graduate Scholarship. -Chris is awarded a 5-year Discovery Grant from the Natural Science and Engineering Research Council of Canada. -A response to a comment on our 2017 Science paper on the effect of climate on global variation in natural selection (link here) is published in the January 26th issue of Science. Check out the response here. ​-Chris travels to the University of Calgary to serve as an external examiner and give a seminar. Thanks to Jana Vamosi for arranging the visit. -Senior thesis student Sarah McDonald receives the Monroe Landon Memorial Scholarship. -Chris' paper on the environmental factors that cause variation in natural selection is published in the September issue of The American Naturalist. This paper is a product of a NESCent working group on the Environmental and Demographic Determinants of Natural Selection. Check out the paper here, and the summary here. -Chris is appointed Editor-in-Chief of the International Journal of Plant Sciences effective January 2018. Check out the announcement here. -Incoming MSc student Ariana Longley is awarded a Graduate Excellence Entrance Scholarship. -Chris travels to Portland to present at the Evolution meetings. -MSc student Hazel Panique presents at the Ontario Ecology, Ethology, and Evolution Colloquium (OE3C). -Ariana Longley, a graduate of the University of Toronto-Mississauga, accepts a MSc position in the lab. -Chris has a paper on the environmental factors that cause variation in natural selection accepted at The American Naturalist. This paper is a product of a NESCent working group on the Environmental and Demographic Determinants of Natural Selection. -Chris is elected treasurer of the American Society of Naturalists. -Sarah McDonald accepts an undergraduate student research assistantship (USRA) position in the lab. -Our paper on the effect of temperature on the maintenance of gynodioecy is highlighted in the March News and Views section of the American Journal of Botany. -Chris' paper on the effect of climate on global variation in natural selection is published in the March 3rd issue of Science. This paper is a product of a NESCent working group on the Environmental and Demographic Determinants of Natural Selection. Check out the editor's summary here, the NSF press release here, and the University of Guelph coverage here. -Chris has a paper on the effect of temperature on the maintenance of gynodioecy accepted at the American Journal of Botany. Thanks to the NSF ROA program for funding this work. -Chris has a paper on the effect of climate on global variation in natural selection accepted at Science. This paper is a product of a NESCent working group on the Environmental and Demographic Determinants of Natural Selection. -Chris becomes a Scientist Mentor for the Understanding Biodiversity section of Frontiers for Young Minds. -Our paper on pollen presentation schedules in Lobelia siphilitica is featured on the cover of the January 2017 isue of International Journal of Plant Sciences. Check out the article here, and the fabulous cover art here. -PhD student Zach Teitel is awarded a Michael Smith Foreign Study Supplement from NSERC. He will be using the award to travel to North Carolina, where he will work with a researcher from North Carolina State University to study the evolution of herbicide resistance in the agricultural weed Amaranthus palmeri. 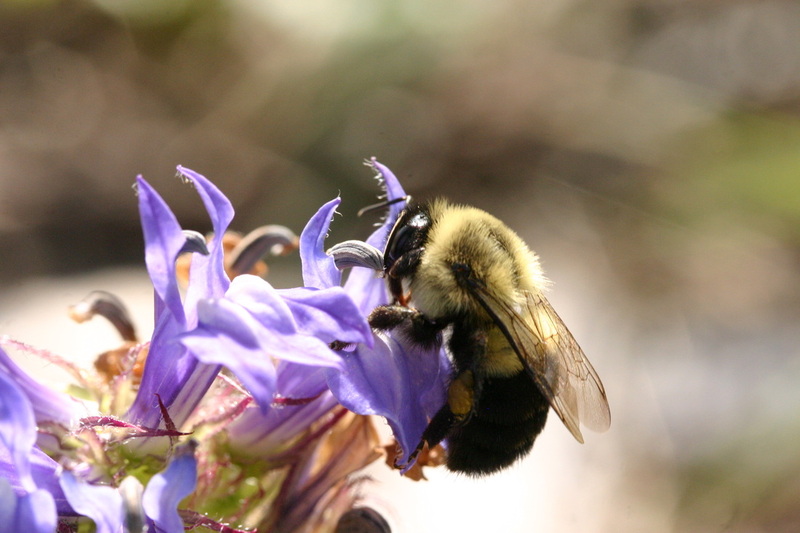 -Chris and former lab technician Kate Eisen have their paper on pollen presentation schedules in Lobelia siphilitica accepted at the International Journal of Plant Sciences. -MSc student Amanda Benoit successfully defends her thesis. -Chris, MSc student Amanda Benoit, and former undergraduate researcher Katie Brown travel to Austin to present at the Evolution meetings. -PhD student Zach Teitel, MSc student Amanda Benoit, and former undergraduate researcher Katie Brown present at the Ontario Ecology, Ethology, and Evolution Colloquium (OE3C). -Senior thesis student Katie Brown receives a Young Botanist Award from the Botanical Society of America. -PhD student Zach Teitel is awarded an Arthur D. Latornell Graduate Travel Grant. -PhD student Zach Teitel is awarded an Alexander Graham Bell Canada Graduate Scholarship (CGS-D). -Chris travels to McMaster University to give a seminar. Thanks to Ian Dworkin for organizing the visit. -Former undergraduate researcher and technician Ruth Rivkin has her paper on the evolution of gynodioecy in the Lamiaceae accepted for publication in New Phytologist. Thanks to the NSF-REU program for funding this work. -We have joined PlantPopNet (http://www.plantpopnet.com/), a globally distributed project on spatial plant population dynamics. -Our paper on the ecological and and morphological correlates of gynodioecy is featured on the cover of the February 2016 issue of International Journal of Plant Sciences. Check out the article here, and the fabulous cover art here. 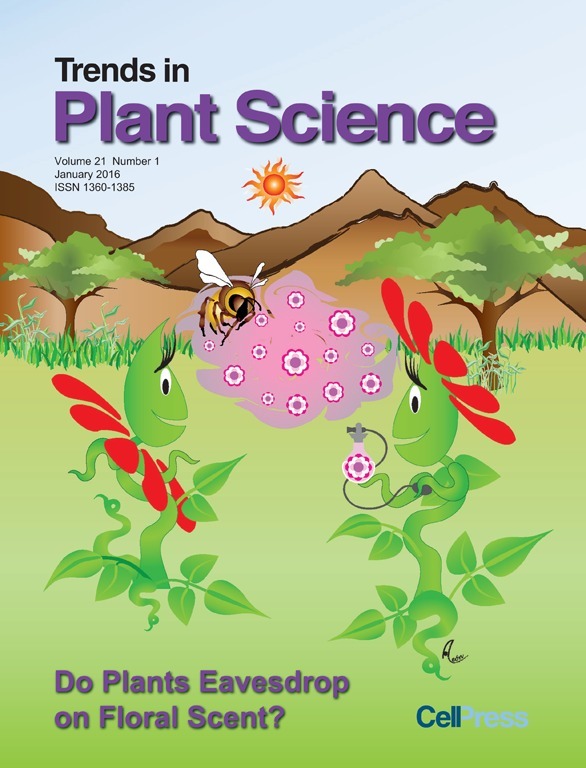 -Our paper suggesting that plants eavesdrop on floral scent signals is featured on the cover of the January 2016 issue of Trends in Plant Science. Check out the article here, and the fabulous cover art here. -Senior thesis student Katie Brown receives the Monroe Landon Memorial Scholarship. -Senior thesis student Katie Brown receives the Tatjana Schulz Vanegas Memorial Scholarship and the University of Guelph Alumni Legacy Scholarship. -Chris and former lab technician Kate Eisen have their paper on the ecological and and morphological correlates of gynodioecy accepted at the International Journal of Plant Sciences. 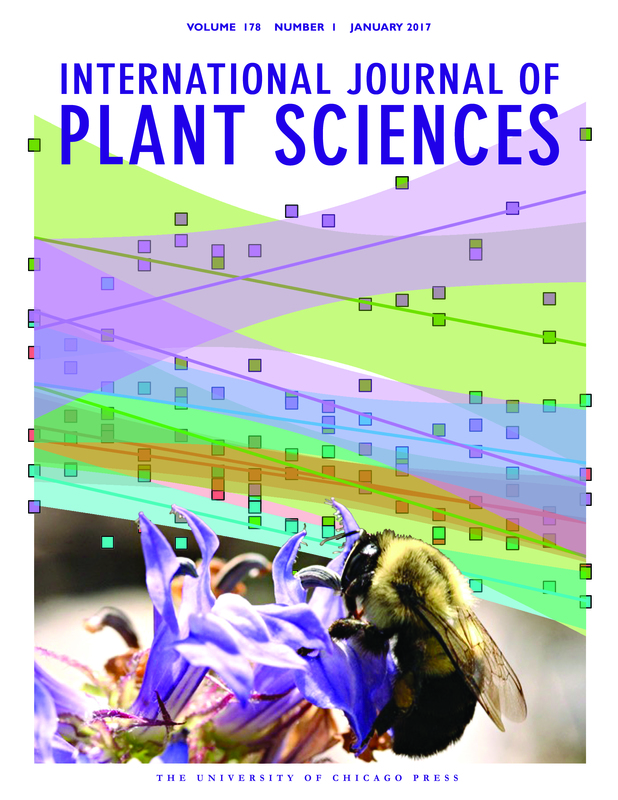 -Chris and former MSc student Amy Parachnowitsch have a collaborative paper (suggesting that plants eavesdrop on floral scent signals) accepted at Trends in Plant Science. -Chris travels to Lausanne for the European Society for Evolutionary Biology meeting. She will be talking in the Symposium on variation in natural selection. -Former lab technician Kate Eisen presents at the Botanical Society of America meeting in Edmonton. She'll be talking about a side project she did on pollen presentation strategies in Lobelia siphilitica. -Chris and Hafiz Maherali travel to the Guelph Montessori School to do a presentation on carnivorous plants for the Lower and Upper Elementary students. -Former undergraduate researcher and lab technician Ruth Rivkin presents at the Ontario Ecology, Ethology, and Evolution Colloquium (OE3C). She'll be talking about her NSF-REU project on the evolution of gynodioecy in the mint family. -Incoming PhD student Zach Teitel receives a Department of Integrative Biology PhD award. -Zach Teitel, a recent MSc graduate from Lesley Campbell's lab at Ryerson University, accepts a PhD position in the lab. Zach will be starting in Fall 2015. -Chris travels to St. John's-Kilmarnock School to do an "Ask an evolutionary biologist" Q&A. Thanks to Grade 4 teacher Nigel Goodfellow for the invitation to visit, and to the students for asking so many interesting questions. -Technician (and former undergraduate researcher) Ruth Rivkin receives a Young Botanist Award from the Botanical Society of America. -Technician (and former undergraduate researcher) Ruth Rivkin has her senior thesis accepted for publication in Evolution. -Chris travels to University of Toronto-Mississauga to give a seminar. Thanks to Marc Johnson for organizing the visit. -Undergraduate Katie Brown is awarded a College of Biological Science Summer Research Assistantship. -Technician (and former undergraduate researcher) Ruth Rivkin receives her BSc (with distinction) from the University of Guelph. -MSc student Jesse Jarvis successfully defends his MSc thesis. -Our side project on outbreeding depression and heterosis in Lobelia siphilitica is accepted for publication in the Journal of the Torrey Botanical Society. Many lab alumni, including technicians Allison Benscoter and Liz Seifert, and undergraduate researchers Nigel Gale and Emily Mills, are co-authors on this work. -MSc student Jesse Jarvis travels to Saskatoon to present at the Entomological Society of Canada meetings. -Chris travels to Boise to give a talk in the "On Models and Methods Pertaining to Plant Reproduction" symposium at the Botanical Society of America meetings. -Incoming MSc student Amanda Benoit is awarded an International Graduate Tuition Scholarship. -Chris, undergraduate Ruth Rivkin, and former lab technician Kate Eisen travel to Raleigh to give talks at the Evolution 2014 meetings. -Chris arrives at the National Evolutionary Synthesis Center (NESCent), where she will be spending two months as a visiting scholar. -Undergraduate researcher Ruth Rivkin wins the award for best talk by an undergraduate at the Ontario Ecology, Ethology, and Evolution Colloquium (OE3C). -Lab technician Kate Eisen and undergraduate researcher Ruth Rivkin present at the Ontario Ecology, Ethology, and Evolution Colloquium (OE3C). -Amanda Benoit, a graduate of Trent University, accepts a MSc. position in the lab. Amanda will be starting in Fall 2014. -Chris arrives at the National Evolutionary Synthesis Center (NESCent) for a working group on the Environmental and Demographic Determinants of Natural Selection. -Ruth Rivkin, a senior thesis student in the lab, will be staying on summer 2014 to work on some phylogenetic analyses of the evolution of gynodioecy. Thanks to the NSF-REU program for funding this project. -Chris joins the editorial board of The American Naturalist. -Lab alumni Erica Wassink's MSc thesis is accepted for publication in Botany. -Lab alumni Rachel Germain's senior thesis is published in the International Journal of Plant Sciences.